well, produce, in no time. So off you go to farm, right? 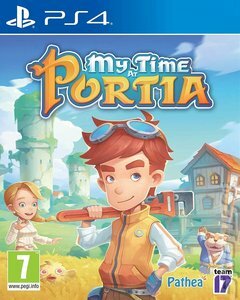 While you think you know the deal, the reality of My Time at Portia is that it offers a lot more than straightforward farming. You could, for example, just set off across the landscape for a spot of adventuring. It s a sandbox world with plenty of monsters to kill and dungeons to conquer. There s nothing to stop you (and, given how profitable these things prove, at some point you probably will do a spot of questing sooner or later). Along the way you ll also need to manage resources, craft vital equipment, nurture relationships with the townsfolk and do a good deal of exploring. The game is, in short, an impressively ambitious blend of genres that includes dungeon crawling RPG, farming sim, craft em up and sandbox adventure. It s made all the more charming by its design. You re in a sort of bucolic post-apocalypse. The world we know long since collapsed and the overgrown corpses of its cities litter the landscape, but it s still somehow like a pastel coloured Studio Ghibli set. My Time at Portia is a peculiarly charming mix of elements that s all its own thing.